Description: This is a Shivastalam in the vicinity of Tiruppugalur and Tiruchenkaattankudi near Naninilam. It is considered to be the 77th in the series of Tevara Stalams in the Chola kingdom located south of the river Kaveri. Also located in the vicinity is Tirukkannapuram, one of the Vaishnava Divya Desams. Legend has it that Rama worshipped Shiva here on his way back to Ayodhya, and hence the name Ramanadeeswaram. Vibhishana is said to have been blessed by Perumaal at Tirukkannapuram in the vicinity. It is believed that Nandi stood in the way of Rama's worship and that Parvati, controlled him, by holding him with her arm, hence the name Ramanandeeswaram. The Somaskanda image of this temple, currently housed at Tiruppugalur portrays Parvati holding the Nandi. The Temple: The Vimanam over the sanctum is a beautiful one, in this rather small temple. Bhrama, Dakshinamurthy and Durga adorn the niches in the sanctum.Inscriptions from the period of Kulottunga Chola are seen here. 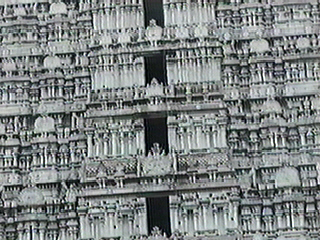 The central shrine was a foundation of the days of Kulottunga Chola I (1075-1120). It was renovated in the days of Kulottunga II and again in the later Pandyan days.